1. Lamb Skewers: In large bowl, whisk together oil, vinegar, oregano, paprika, cumin, coriander, garlic, salt and pepper; toss with lamb until well coated. Marinate for at least 1 hour or for up to 12 hours. 2. Preheat grill to medium-high heat; grease grate well. Toss marinated lamb with red pepper; thread lamb and red pepper evenly onto 8 soaked wooden skewers. Grill, turning occasionally, for 8 to 10 minutes or until lamb is cooked to desired doneness. 3. Meanwhile, prepare Superfries according to package directions. Before the last 5 minutes of cooking, remove from oven and toss with oil, oregano, salt, pepper and garlic powder. 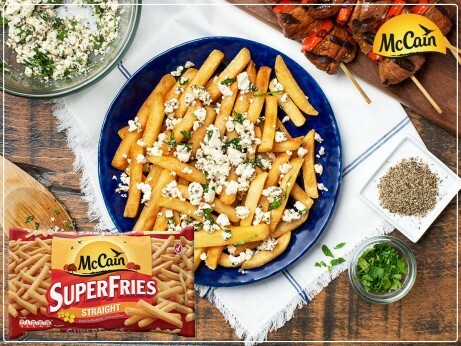 Return Superfries to the oven for the remaining 5 minutes or until crisp and fully cooked. 4. Toss together feta, parsley and lemon zest; sprinkle over Superfries. Serve with Lamb Skewers. 1 Lamb Skewers: In large bowl, whisk together oil, vinegar, oregano, paprika, cumin, coriander, garlic, salt and pepper; toss with lamb until well coated. Marinate for at least 1 hour or for up to 12 hours. 2 Preheat grill to medium-high heat; grease grate well. Toss marinated lamb with red pepper; thread lamb and red pepper evenly onto 8 soaked wooden skewers. Grill, turning occasionally, for 8 to 10 minutes or until lamb is cooked to desired doneness. 3 Meanwhile, prepare Superfries according to package directions. Before the last 5 minutes of cooking, remove from oven and toss with oil, oregano, salt, pepper and garlic powder. Return Superfries to the oven for the remaining 5 minutes or until crisp and fully cooked. 4 Toss together feta, parsley and lemon zest; sprinkle over Superfries. Serve with Lamb Skewers.